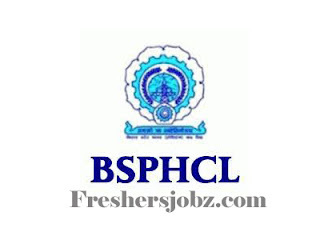 BSPHCL Notification 2018.Bihar State Power Holding Company Limited (BSPHCL) has released a notification for the recruitment of AEE, AE, IT Manager, Jr Accounts Clerk and more vacancies.Check the eligiblity and notification prior to apply for the positions. Candidates would be shortlisted on the basis of marks obtained in PAPER BASED WRITTEN EXAM (OMR Based). Syllabus is attached for all the posts. 1. The applicants are to apply through "ON LINE" on the Website of www.bsphcl.bih.nic.in. The Website will open from 16/10/2018. After filling up the ON-LINE application; Candidates must take a print out of the Registration Form for future reference and downloading of Admit Cards etc. 2. Please note that after submission of online application form, if any modification is required in the online application form such as correction in Name/Category/Date of Birth/Father's Name etc, the candidate may modify/ edit their application form within the stipulated time frame i.e. 01.11.2018 to 02.11.2018 (till 6:00 PM). 4. There is a prescribed fee for Online Application Form. Candidates will be directed for online payment once the form is completely filled. Candidate is requested to keep his/her Credit Card/ Debit card/ Net Banking details ready for the same. Candidates are required to carefully go through the Instructions for filling online application. 5. No TA/ DA will be paid to the Candidate, if called for paper based test / documents verification etc.Mere submission of application does not guarantee the adequacy of candidature for being considered for selection process.Provisional Admit Card will be issued only on the basis of information furnished by the applicant.The selected candidates shall have to produce relieving letter from the present employer at the time of joining his duty on the selected post. The BSPHCL will not be responsible for any printing mistakes. Generation & Printing of Registration Slip.